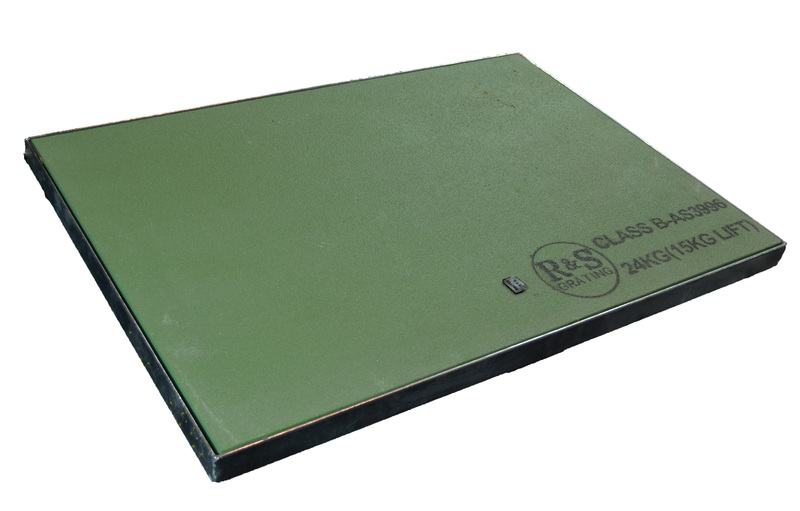 R&S Grating stock a range of FRP (Fibreglass Reinforced Plastic) covers, designed to cover side entry and junction pits. 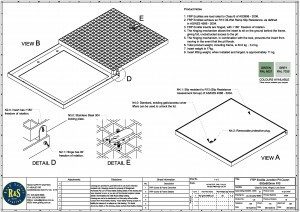 Our FRP Ecolite range is rated to Class B of AS3996 – 2006, designed for Ultimate Limit State Design Load of 80 Kilonewtons loading. 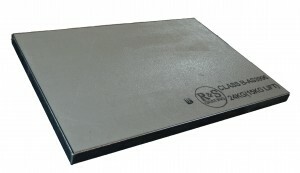 Through consultation with local governments and industry, our FRP Ecolite range has been developed to include a hinging and lock down mechanism, securing the insert to the frame and preventing the lid from dislodging during flooding. 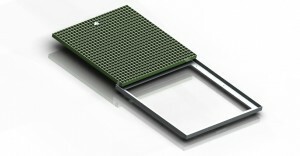 The innovative design has also resulted in a reduced lifting force, requiring a maximum of 15kg of exertion to open, once installed. Additionally, the FRP Ecolite range can be unlocked using standard AS3996 – 2006 specified lifting keys. 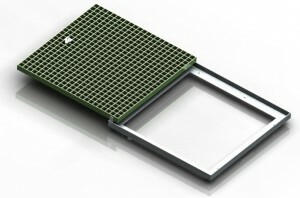 Read more on the design. 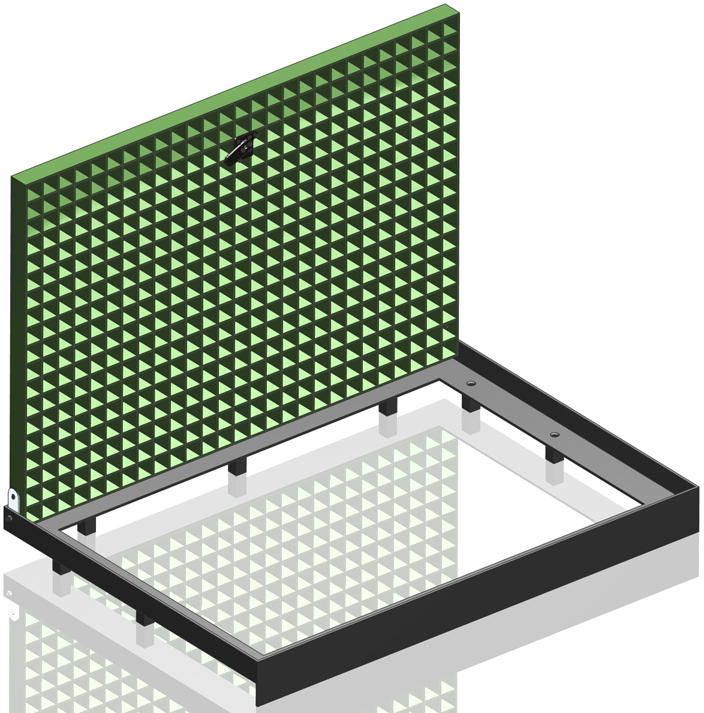 One of the biggest advantages of the FRP Ecolite range is its hinging mechanism (registered design). The hinging mechanism not only secures the insert to the frame, preventing it from becoming fully detached, but also decreases the required lifting weight of the insert to 15.0 kg (maximum). The hinging mechanism makes use of a hinging plate, which has 90° freedom of rotation. 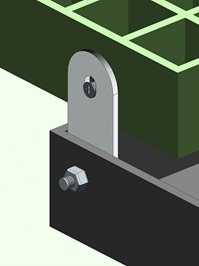 The hinging plate is attached to both the insert and the frame, as shown in figure 1. Additionally, the insert has 180° freedom of rotation. 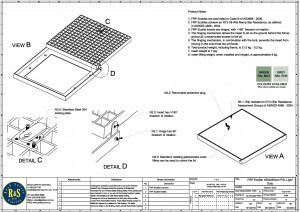 This allows the insert to be opened and placed lying flat behind the pit. This allows full, unobstructed access to the pit. 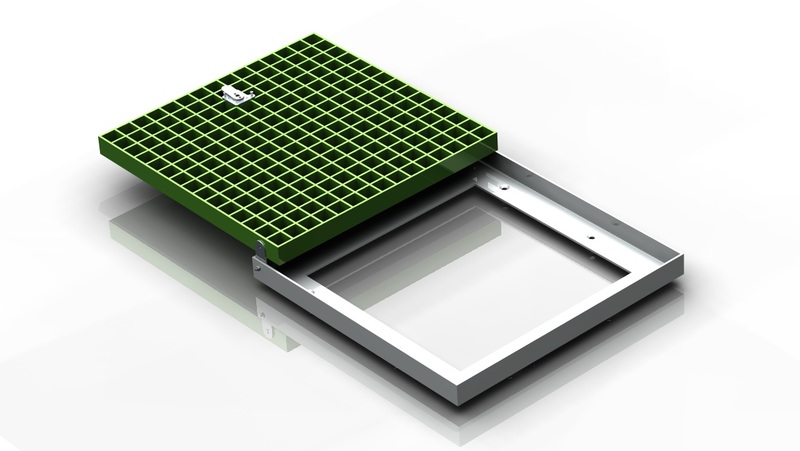 In the event of flooding, the hinging mechanism also provides an additional source of protection from the insert dislodging, though the locking mechanism prevents the lid from dislodging when locked. 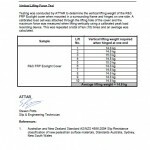 Testing has shown the average lifting weight of the insert to be 14.8 kg once hinged, with a maximum lift weight of 15.0 kg. The FRP Ecolite hinge is a registered design. 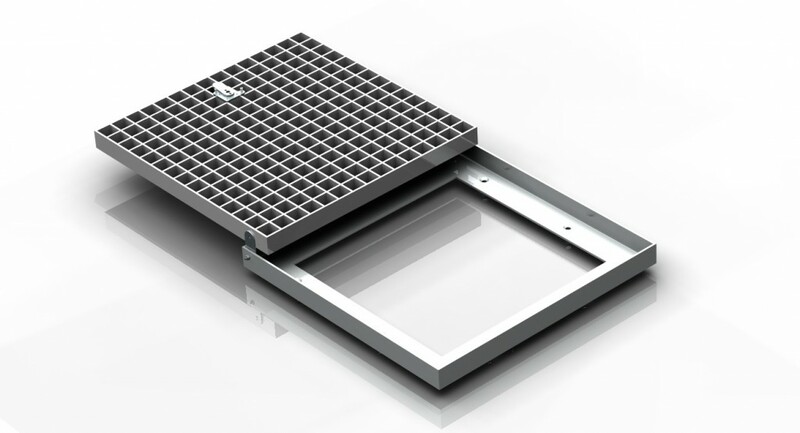 The FRP Ecolite range is fitted with a stainless steel locking mechanism, designed to prevent unwanted access, while also securing the insert in the event of flooding. 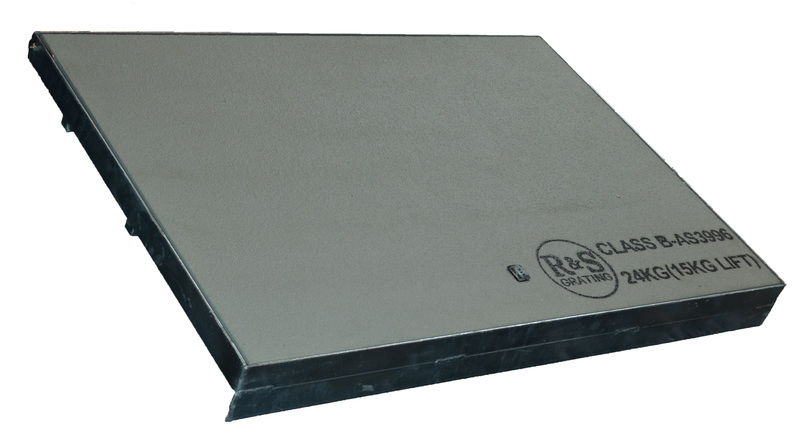 The locking mechanism is operated with standard AS3996 specified lifting keys. 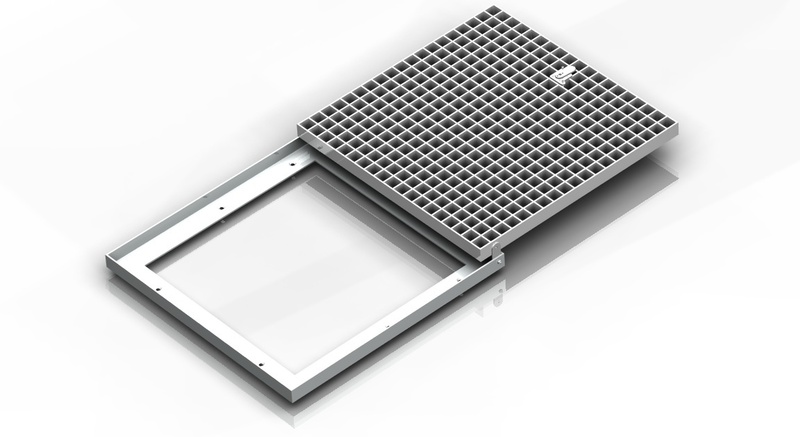 The locking mechanism includes a recessed swivel cylinder, designed to house standard 25x15mm lifting keys. When the locking mechanism is in the open position, the lifting keys cannot be removed from the lid. This prevents the cover from being accidentally left unlocked. 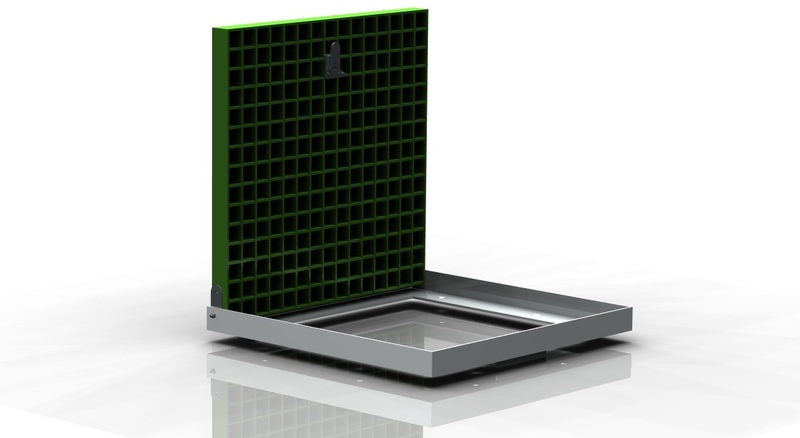 Additionally, the FRP Ecolite lid cannot be fully closed from an open position, while the lock is in the closed position, as the locking plate prevents the lid from sitting flush in the frame. This reminds operators that the lid is not locked. The locking mechanism also includes two stopper screws, permitting only 120° of rotation. 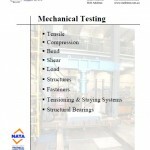 All components of the locking mechanism are made of stainless steel. 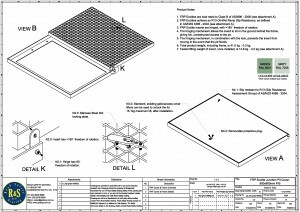 A protective panel is also included standard in all junction pit FRP Ecolite lids, to protect the locking plate during installation. 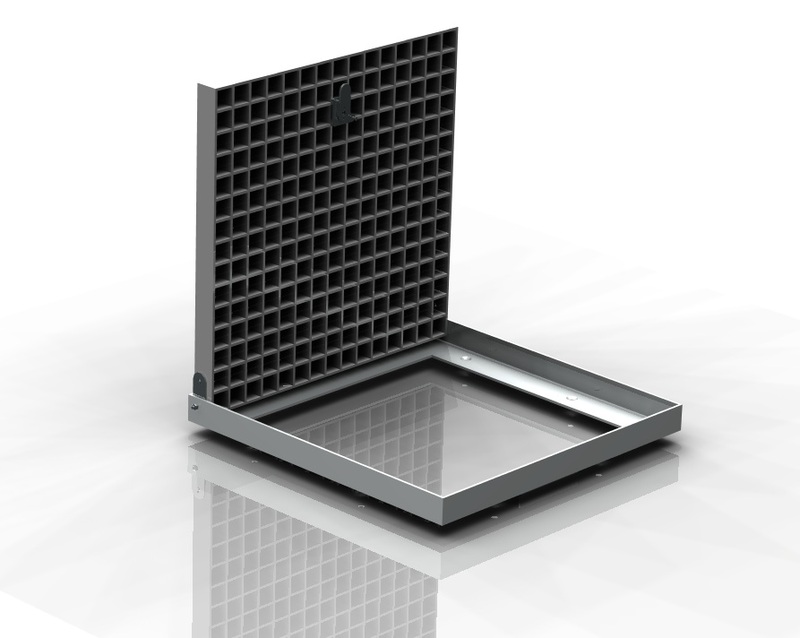 Side entry pit FRP Ecolite lids are protected by the side entry plate on their frame. 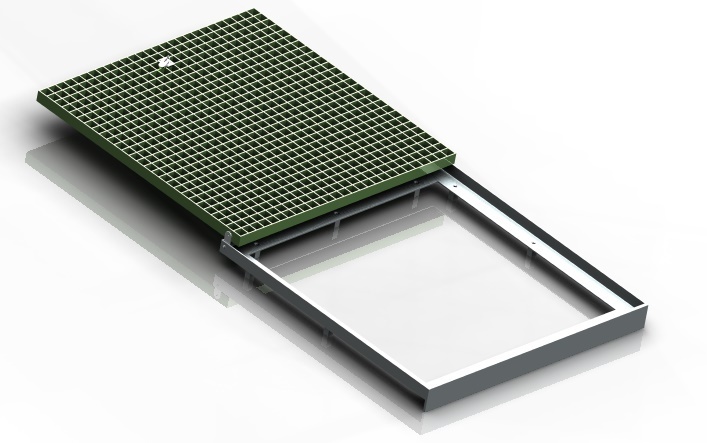 Although existing AS3996 lifting keys can be used to open FRP Ecolite lids, Road Safety Grating also offers lifting keys specifically designed for the FRP Ecolite. Watch a fully loaded tip truck traverse an FRP Ecolite. Product specifications for each FRP Ecolite are available in the “Downloads” tab of each listing below in “Available Products”. 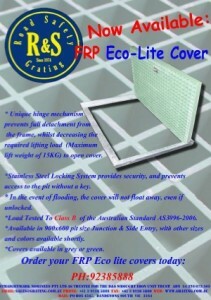 FRP Ecolite Covers are currently available in the following sizes. 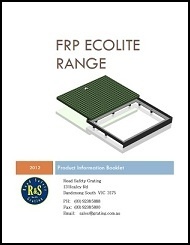 900x600mm (pit size) FRP Ecolites are available for both junction and side entry pits. *Other colours are available upon request. 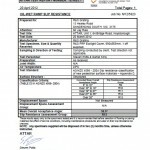 *Test results for the FRP Ecolite range are available above in the “Available Downloads” section.